Aqua Marina is a well-known company providing paddle boards for fitness and leisure. They envision offering maximum safety and fun for paddle boarders with their array of inflatable paddle boards. They provide affordable and versatile paddle boards for kids, beginners and experienced paddlers. 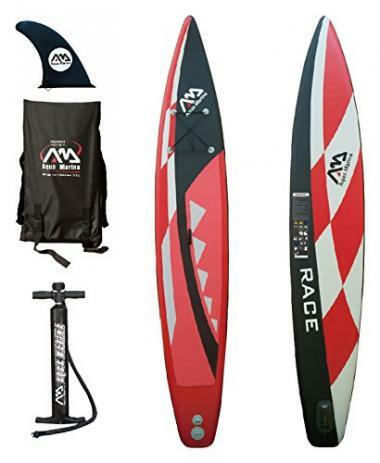 They also provide Aqua Marine boards for SUP fishing, racing and all-purpose recreational use. In this review, we’ll take a look at 8 high-quality Marina boards including reasons why we picked them to help you purchase the best Aqua Marina SUP before heading down the river to enjoy your favourite water sport of paddling. Looking for an affordable and easily portable fishing vehicle? Aqua Marina Drift will give you value for your money and an easy time while transporting it. The paddle board’s dimensions and design makes it very stable on top of the water and is perfect for beginners. You can also balance yourself on it easily while waiting for a catch making this paddle board our top-rated Aqua Marine SUP. The paddle board’s double-sided rail design offers maximum stability for an ideal fishing and paddling experience. This model features two built-in fishing rod holders, centre fin, deck traction pad, fishing backpack, EVA deck for comfort, pump with gauge, fishing cooler and removable fish cooler box with a high back seat. 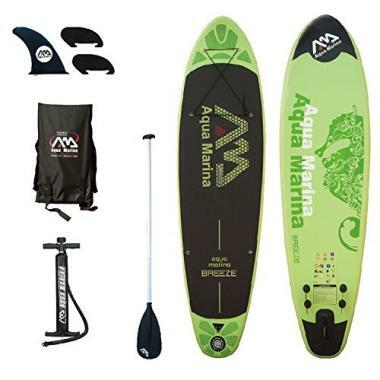 Aqua Marina Breeze offers great stability and is ideal for leisurely and fitness paddling. The Breeze has a versatile shape for stand up paddling or surfing and a removable tri-fin configuration for improved adaptability. 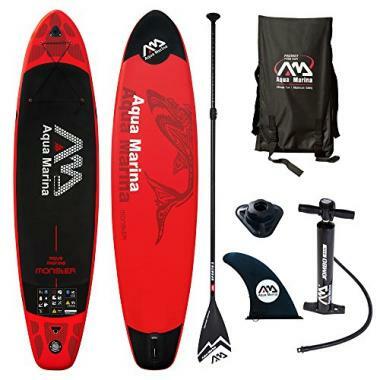 This Aqua Marina inflatable paddle board is built with durable double-wall drop stitched PVC technology for maximum durability and is designed for paddlers looking for low weight and volume which results in better maneuverability. A removable tri-fin cluster and classic pintail geometry provide speed and control in any water conditions. This paddle board deflates and packs up in the included magic backpack for easy transportation and storage. It’s built for paddle boarders of up to 209 pounds and inflates quickly with most modern pumps. It comes with adjustable aluminium two-piece SUP paddle, a bungee to hold cargo, stainless steel D-rings for leash and EVA deck with honeycomb groove design for maximum traction and comfort. 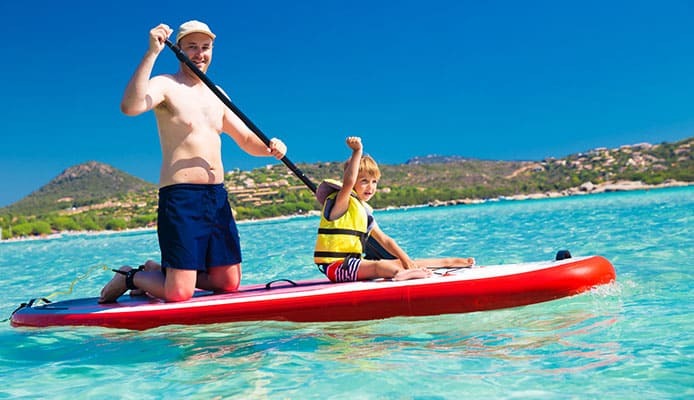 Aqua Marina Vapour is another perfect stand up paddle board for beginners, kids and novice paddle boarders. It’s also a versatile and user-friendly SUP making water sports more fun. It features an all-around, wide-style design perfect for learning, small wave riding and recreational paddling. This paddle board is heat embossed, built with 4-inch double-wall drop stitch core material and honeycomb groove for maximum durability and traction. It also includes extra D-rings to attach to the kayak seat, magic backpack, tri fin system, EVA deck, pump with gauge, stainless steel D-ring on the tail for safety leash and 3 piece paddle. 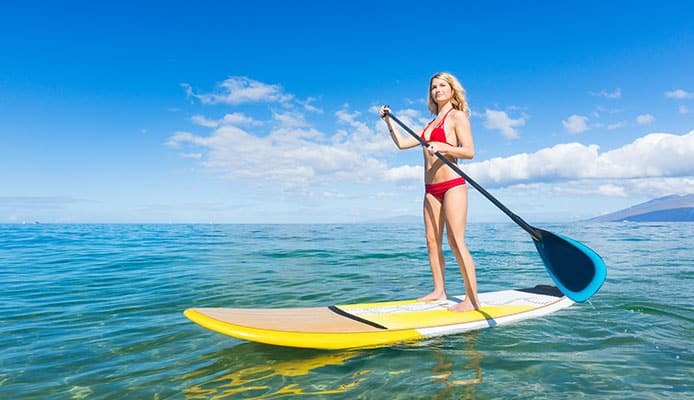 The Fusion paddle board is a highly versatile product meaning it can be used for flat-water cruising, fitness paddling, SUP yoga, recreational paddling among other fun activities. It has a moderate weight of 21 pounds and falls in the medium length category. Aqua Marine Fusion paddle board is perfect for paddle boarders of all skill levels. An all-around wide design and durable double-wall stitching PVC provides superior stability. The bungee cords on the nose will hold your cargo and the heat-embossed EVA deck with honeycomb grooves will keep you from slipping while exploring calm waters. This board deflates quickly and can be packed up in the included magic backpack. 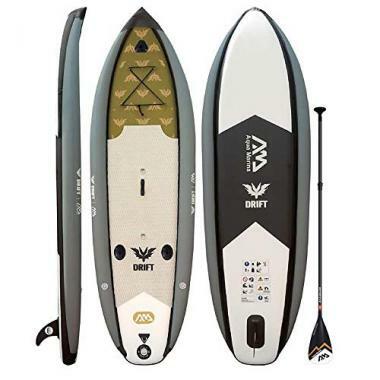 It’s built for paddlers of up to 308 pounds and has a removable fin for added control on the water and inflates quickly with most modern pumps. It also comes with a 1-year warranty. If you’re a paddle boarder with a large body looking for the ultimate stability, you’ll benefit from Aqua Marina Monster paddle board. It’s a great board that will allow you to enjoy the fun that an all-around paddle board offers. 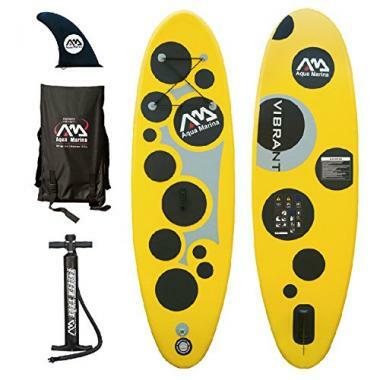 Due to its high versatility, it is ideal for both beginner and experienced paddle boarders. 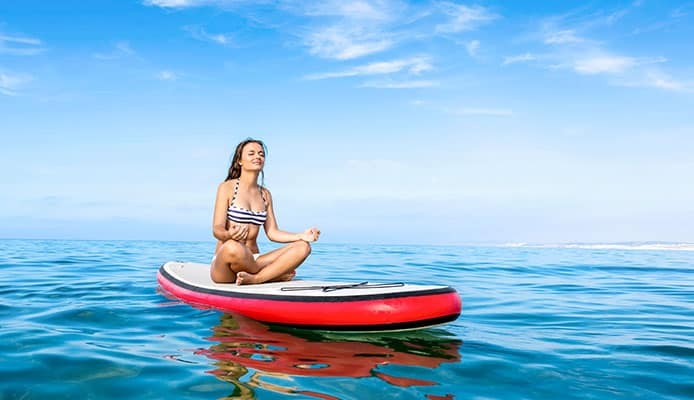 This paddle board is a great choice for yoga and all day paddling. It has superior stability and performs like a rigid board. It also has a single fin set up to allow the board track well in flat water. 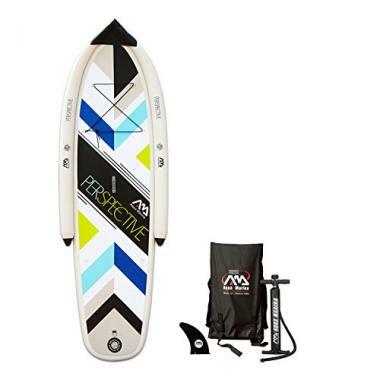 The Monster paddle board comes with a universal action camera mount base, pump, detachable fin, carry bag and adjustable paddle. The elastic bungee cord and stainless steel D-rings are for holding a dry bag, cooler, or any other extra items you may need for a fun time exploring the water. It’s built with 6-inch double-wall drop stitch PVC for maximum durability. It also has an extra large anti-slip deck pad that’s heat embossed with honeycomb groove to provide comfort. Perspective is recommended for you if you’re looking for a paddle board that’s great for beginners. Paddle boarders who are just starting out paddle boarding often find it difficult to balance on the board. However, with Perspective’s independent side chambers, floating has been made easier. Perspective Aqua Marine SUP is also great for intermediates or kids who want to learn the basics of paddle boarding. Its unique rail design makes it easy to paddle and very user-friendly. The side chambers allow the board to have superior stability while the wide deck sits at a lower position than the rails allowing you to walk around and change your position without flipping over. It’s perfect for paddle boarders of up to 176 pounds and has a brushed EVA deck for maximum comfort. It also has D-rings for attaching kayak seat. 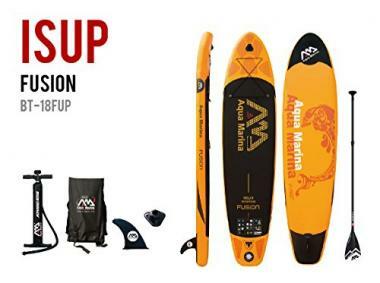 Aqua Marina inflatable SUP has an eye-catching design and is a real pleasure to ride. It’s perfect for beginners and kids. The lightness and stability of this board makes it easy to carry with you in a magic backpack. It's rigid and feels similar to a hardboard. Vibrant paddle board is ideal for paddle boarders that want to use the board both for competition practice and relaxation. The maximum recommended weight for this board is 154 pounds. It's constructed with drop-stitch and PVC material for durability. The paddle board accessories include stainless steel D-ring for safety leash, centre fin, magic backpack, EVA deck for comfort and pump with gauge. Race Competitive is a board on the longer side and the only paddle board specifically designed for paddle board racing. It will enable you to paddle fast and for long distances due to a sleek and narrow design but with less stability because it is a narrow board. The Race is your perfect match if you’re an experienced paddle boarder looking for a performance-oriented board. It’s the ultimate board for all-around cruising and a true racing machine. This paddle board is designed for strength, shape precision and better rigidity. It includes magic backpack, centre fin, stainless steel D-ring for the leash, pump with gauge and elastic bungee cords for cargo. Before you invest in your next Aqua Marina inflatable paddle board, consider the following factors to help you choose the best Aqua Marina paddle board that has the specific details you’re looking for depending on your needs. The length of the board you choose matters if you want a board that focuses more on speed or stability. A longer board with 12 ft range will be faster compared to a 9 ft board. Racing boards are often narrow and long and can easily slice through rough waters. This is the type of board that’s commonly used by paddle boarders who want a paddle board they can use to work out on. If your choice is a fast board that can easily handle a day at the beach, then opt for a paddle board that’s at least 12 ft long. A shorter, wider paddle board will offer more stability. These are usually the perfect boards for beginners who are just learning the basics of SUP yoga and need something stable to learn how to perform basic moves. These boards are used for yoga because they provide a solid foundation on the water. The wider your board is, the more stable it will be for you while on the water. However, more surface area means more weight. You should, therefore, try to find the right balance of the two for your abilities to ease things. It’s a good idea to go for boards that use double/triple or even quadruple layers of PVC for maximum strength and durability as opposed to those that only use a single outer PVC layer. Aqua Marina paddle boards are an excellent choice since they use double layers. You should pay attention to the specs sheet that’s usually provided by the manufacturer for each board to determine if a new paddle board is the right length, width and thickness for you before you buy. Most manufacturers list the different volumes, width and size clearly on the specs sheet. The high cost of paddle boards can easily put off those paddle boarders that want to take up the sport. You can get a paddle board for as a little as $300, but it won’t perform as well as the more expensive boards because it is made from low-quality materials. You should invest in a paddle board that’s durable if getting into paddle boarding is your goal. In the long run, you won’t have to incur extra costs on repairs or even buying another paddle board. When researching boards and figuring out the model that’s right for you, start off by shopping online. You’ll find high-quality paddle boards that are within your budget. Each Aqua Marina paddle board is built with their own drop stitch core technology. This is a process where thousands of individual threads support the top and bottom layers. This technology changes the board from a big floppy structure to something that can hold its form. Aqua Marina uses a PVC deck that has been treated with plenty of UV protection. The layers are then wrapped with both internal and external PVC rail tape. Also included in the construction of the board are hard rubber and multiple layers of polymer for maximum strength and durability. Q: Why Choose An Aqua Marina Paddle Board? Inflation only takes a few minutes while deflation is even quicker so you can be ready to go in less time than it usually takes to detach a solid board from a roof rack. You don’t have to worry about storage space. When not in use, Aqua Marine SUP board can be rolled up to a small size. This means you can store and take your paddle board anywhere with you. They’re affordable and cost only a few hundred dollars. Regardless of your budget, you’ll still find a quality board bringing them into the category of inexpensive water sport hobby items. They’ve some sort of fin configuration for improved adaptability. Q: What Are The Pros And Cons Of An Aqua Marina Paddle Board? A: There are many advantages of using an Aqua Marina inflatable SUP. But there also exists downsides of owning this SUP. Let’s first begin with the positive aspects of this paddle board. These boards are better suited for rocky shores and river paddling. They aren’t flimsy whereas a fibreglass board will get dinged in case it crashes into rocks, an inflatable board will bounce right off. Any type of repairs is unlikely since they’re tough. The most common reason for owning an inflatable board is because they are extremely easy to transport. They are small and compact when deflated and fit into a large magic backpack or carry bag. You can transport them easily in an RV, trunk of your car or on a boat. They are very convenient to take anywhere including on a cruise ship. Every paddler falls at some point while stand up paddling especially when first starting out or paddling in waves. Although iSUP’s can be rigid, they don’t have the same hard surface like that of a fibreglass board. You are unlikely to feel the impact if you fail. This can be great especially for beginners or kids. They are an ideal choice for paddlers who may want to SUP with their pup. You can take your dog with you on your paddling trip because the inflatable board is great and stable for him. The surface will allow him to sit without his paws sliding around as he might do on a fibreglass board. It can be very difficult and costly to travel with a fibreglass board. However, transporting stand up paddle boards is very easy. You can check them onto a ship or aeroplane with no extra fees because they don’t take up much space or weigh very much. Bringing a paddle board along on your travels usually opens up a lot of opportunities. You will get a chance of paddling in waters that you never would have otherwise been able to. Inflatable SUP’s are more stable than a hard-shell board. They offer a more stable ride and are much easier to learn on. You don’t have to worry about constructing a storage shed or looking for a garage to store a stand paddle board. These boards can be deflated, rolled up into their carry bag and stored in a closet. This makes it great for paddle boarders that lack storage space. Aqua Marina paddle boards are cheap but also of high-quality meaning you will be able to find a board that’s within your price range. Flex (sinking in the middle of the board) is a common complaint with the inflatable stand paddle boards. Paddle boarders end up feeling frustrated as it limits performance. However, you can easily solve this problem by ensuring you have inflated the board to the proper level, especially with good boards. In general, the heavier you are, the more air pressure the board will need. Paddles aren’t always included with every board leading to extra costs incurred since you will need to purchase a paddle separately. Q: What Is The Difference Between A Regular And An Aqua Marina Paddle Board? A stainless steel D-ring system for onboard storage with bungee straps for attaching a kayak seat or leash. Extra strong and durable double-wall drop stitch PVC. An EVA deck pad with a honeycomb groove design for maximum comfort and traction. Paddle boarding is an exciting water sport and also a great way to exercise. 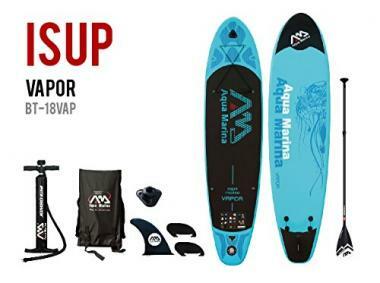 We hope our in-depth Aqua Marina paddle boards review will help you get a better idea on which SUP suits your needs best.